Today I have another one of OPI's new San Francisco polishes to share with you, Keeping Suzi at Bay*. This is OPI's 2013 Fall collection, so a lot of the polishes are a bit darker. I'm still loving Summer, but these deeper, darker polishes are a welcome change. 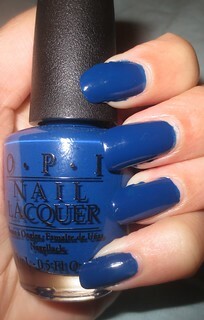 OPI's Keeping Suzi at Bay is a beautiful cobalt blue shade. This creme finish is perfect on it's own, but I'm also thinking that it would be great to use as a base under a glitter polish. This formula was incredibly pigmented, and I almost got away with just one coat. However, I decided to add a second coat to deepen the colour and even out any streaks. I did add OPI's Top Coat to add a bit of extra shine. This polish dried fairly quickly, and I wasn't left with any streaks, bald spots, or any other issues. OPI's Keeping Suzi at Bay is a beautiful shade that I think will be a great transition colour going into Autumn. 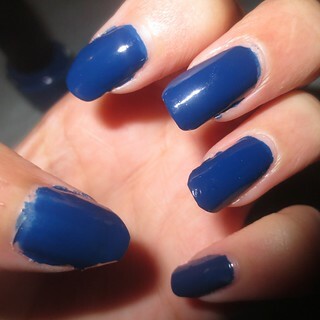 This shade is a mid-toned navy, but it does appear a bit darker in person than in pictures. The formula was great for this polish, so if you don't already own a similar shade then I would recommend picking up Keeping Suzi at Bay. The actual colour isn't terribly unique, so if you already own a similar shade, I would skip on this one. This polish will be perfect for Fall!